After graduation with his B.Sc. in Mathematics from Shanghai Jiao Tong University, Xian Zhou went overseas to study at University of California at Santa Barbara, where he completed his M.A. in Statistics and Ph.D. in Mathematics. Before joining Macquarie University, he worked at University of Western Australia and The Hong Kong Polytechnic University as Lecturer, Assistant Professor and Associate Professor. His research interests include survival analysis, actuarial science, and stochastic scheduling. He has jointly published over 60 papers in these areas on international journals, including Annals of Statistics, Journal of American Statistical Association, Biometrika, Biometrics, Insurance Mathematics and Economics, Operations Research, and Journal of Scheduling. Xian Zhou has played active roles in actuarial education, including the Programme Leader for B.Sc. (Honours) in Actuarial Science at The Hong Kong Polytechnic University and teaching major actuarial subjects such as risk theory, survival analysis, loss models and credibility theory, at both undergraduate and Masters levels. Multi-processor job scheduling in stochastic environments, Competitive Earmarked Research Grant (CERG), University Grant Council of Hong Kong (UGC) (HK$360,000), Principal-Investigator, 1997-2000. Earliness/tardiness scheduling subject to known due dates and an unknown deadline, CERG, UGC (HK$622,000), Co-Investigator, 1999-2002. Deterministic and Stochastic Scheduling Models for Team-work Jobs, CERG, UGC (HK$437,817), Principal-Investigator, 2000-2002. Stochastic scheduling with preemptive-repeat machine breakdowns, CERG, UGC (HK$580,873), Principal-Investigator, 2001-2004. Optimal scheduling under stochastic order, CERG, UGC (HK$413,404), Principal-Investigator, 2002-2004. Optimal decisions in processing discountable products to be delivered by multiple transporters, CERG, UGC (HK$324,000), Principal-Investigator, 2003-2005. Stochastic scheduling subject to machine breakdowns with partial loss of work and information, CERG, UGC (HK$506,447), Principal-Investigator, 2004-2007. Stochastic scheduling for production and delivery of perishable products with imperfect information, Discovery Project, Australian Research Council (AU$150,000), Sole Chief-Investigator, 2010-2012. Enhanced models of disability and medical costs, The Institute of Actuaries of Australia ($15,636), Team Leader, 2011-2012. Actuarial applications of model selection strategies using the Gibbs Sampler, The Institute of Actuaries of Australia ($10,661), Team Researcher, 2011-2012. Fair valuation of modern insurance products under GARCH-type models: from market risk to mortality risk, The Institute of Actuaries of Australia ($18,657), Team Researcher, 2011-2012. Dynamic stochastic scheduling with uncertain loss of work subject to machine breakdowns: a unified approach via semi-Markov transition, Research Grant Council of Hong Kong (HK$662,400), Co-Investigator, 2011-2014. Estimation for competing risks in lifetime data with long-term survivors, University Research Grant (URG), The Hong Kong Polytechnic University (HK PolyU) (HK$205,000), Principal Investigator, 1997-2000. Stochastic Scheduling with Earliness and Tardiness Penalties subject to Random Machine Breakdowns, URG, HK PolyU (HK$200,000), Principal Investigator, 1998-2001. Statistical Inference on Seemingly Unrelated Partially Linear Models with One-Way Error Component Structure, URG, HK PolyU (HK$90,000), Principal Investigator, 2005-2007. Stochastic Scheduling Subject to Multiple Types of Machine Breakdowns, URG, HK PolyU (HK$150,000), Principal Investigator, 2006-2008. Semiparametric Modelling of Medical Cost Data, Macquarie Research Development Grant, Macquarie University (AU$49,273), Chief-Investigator, 2008-2009. Stochastic scheduling for production and delivery of perishable products with imperfect information, Discovery Project, Australian Research Council, Sole Chief Investigator. A Bayesian Nonparametric Approach for Corporate Default Risk Analysis, Australian Actuarial Research Grants, Team Researcher. 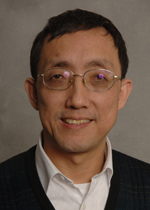 A/Prof Zhou's research area is survival analysis, which studies the random durations of event of interest (such as death or the failure of a product). His research relates to financial risks via medical costs, life contingencies, losses for insurance claims, failures of companies, and the settlement of debts. Zhao, X.B. and Zhou, X. Modelling gap times between recurrent events by marginal rate function. Computational Statistics and Data Analysis, 56, 370-383, 2012. Zhao, X.B., Zhou, X. and Wang J.L. Semiparametric model for recurrent events data with excess zeros and informative censoring. Journal of Statistical Planning and Inference, 142, 289-300, 2012. Zhao, X.B. and Zhou, X. Measurement error in proportional hazards models for survival data with long-term survivors. Acta Mathematicae Applicatae Sinica, English Series, 28(2), 275-288, 2012. Sun, L., Zhou, X. and Guo, S. Marginal regression models with time-varying coefficients for recurrent event data, Statistics in Medicine, 30(18), 2265-2277, 2011. You, J., Zhou, X., Zhu, L. and Zhou, B. Weighted denoised minimum distance estimation in a regression model with autocorrelated measurement errors. Statistical Papers, 52(2), 263-286, 2011. Sun, L., Tong, X. and Zhou, X. A class of Box-Cox transformation models for recurrent event data. Lifetime Data Analysis, 17(2), 280-301, 2011. Cai, X., Wu, X. and Zhou, X. Scheduling deteriorating jobs on a single machine subject to breakdowns, Journal of Scheduling, 14(2), 173-186, 2011. You, J., Zhou, X. and Zhou, Y. Series estimation in partially linear in-slide regression models, Scandinavian Journal of Statistics, 38, 89-107, 2011. You, J. and Zhou, X. Statistical inference on seemingly unrelated varying coefficients partially linear models, Statistica Neerlandica, 64(2), 227-253, 2010. You, J., Zhou, X. and Zhou, Y. Statistical inference for panel data semiparametric partially linear regression models with heteroscedastic errors, Journal of Multivariate Analysis, 101(5), 1079-1101, 2010. Zhao, X.B. and Zhou, X. Receiver operating characteristic curve for two-sample comparison with cure fractions. Lifetime Data Analysis, 16(3), 316-332 2010. Zhao, X.B. and Zhou, X. Applying copula models to individual claim loss reserving methods. Insurance: Mathematics and Economics, 46(2), 290-299, 2010. Cai, X., Wu, X. and Zhou, X. Stochastic scheduling subject to preemptive-repeat breakdowns with incomplete information. Operations Research, 57(5), 1236-1249, 2009. Zhao, X.B., Zhou, X. and Wu, X. (2009) A change-point model for survival data witih long-term survivors. Statistica Sinica, 19, 377-390. You, J. and Zhou, X. (2009) Partially linear models and polynomial spline approximation for the analysis of unbalanced panel data, Journal of Statistical Planning and Inference, 139(3), 679695. Wen, L., Wu, X. and Zhou, X. (2009) The credibility premiums for models with dependence induced by common effects. Insurance: Mathematics and Economics, 44(1), 19-25. Wu, X. Wang, J. and Zhou, X. (2009) Estimation of Multi-Stage Survival Distributions Based on Age Stage Data. Australian Actuarial Journal, 15(1), 117-142. You, J., Zhou, X. and Zhu, L.X. (2009) Inference on a regression model with noised variables and serially correlated errors. Journal of Multivariate Analysis, 100(6), 1182-1197. Cai, X., Wu, X. and Zhou, X. (2009) Stochastic scheduling on parallel machines to minimize discounted holding costs. Journal of Scheduling, 12(4), 375-388. Zhao, X.B., Zhou, X. (2009) Semiparametric modelling of medical cost data containing zeros. Statistics & Probability Letters, 79(9), 1207-1214. Zhao, X.B., Zhou, X. and Wang, J.L. (2009) Semiparametric model for prediction of individual claim loss reserving Insurance: Mathematics and Economics, 45(I), 1-8. Sun, X.and Zhou, X. (2008) Improved minimax estimation of the bivariate normal precision matrix under the squared loss, Statistics & Probability Letters Volume: 78 Issue 2: 127-134. Sun, X., Zhou, X. and Wang J. (2008) Confidence intervals for the scale parameter of exponential distribution based on Type II doubly censored samples, Journal of Statistical Planning and Inference, Volume 138, Issue 7, 2045-2058. Zhao, X.B, Zhou, X. (2008) Discrete-time survival models with long-term survivors, Statistics in Medicine, 27:1261ââ‚¬"1281. Wu, X. and Zhou, X. (2008) Stochastic scheduling to minimize expected maximum lateness, European Journal of Operations Research, vol. 190, issue 1, 103-115. Wang, S., Shao, Q and Zhou, X. Knot-Optimizing Spline Networks (KOSNETS) for Nonparametric Regression, Journal of Industrial and Management Optimization, Vol.4, No.1 33-52. Sun, L. and Zhou, X. (2008) Inference in the additive risk model with time-varying covariates subject to measurement errors. Statistics & Probability Letters, Volume 78, issue 16, 2559-2566. Cai, X., Wang, L. and Zhou, X. Single-machine scheduling to stochastically minimize maximum lateness. Journal of Scheduling, 10, 293-301, 2007. Cai, X., Wu, X. and Zhou, X. Single-Machine scheduling with general costs under compound-type distributions. Journal of Scheduling, 10, 77-84, 2007. Zhao, X.B, Zhou, X. and Wu, X. Local linear regression in proportional hazards model with censored data. Communications in Statistics-Theory and Methods, 36(15), 2007. Wu, X and Zhou, X. A new characterization of distortion premiums via countable additivity for comonotonic risks. Insurance Mathematics and Economics, 38, 324-334, 2006. Cai, X. and Zhou, X. Stochastic scheduling with asymmetric earliness and tardiness penalties under random machine breakdowns. Probability in the Engineering and Informational Sciences, 20, 635-654, 2006. Zhao, X.B. and Zhou, X. Proportional hazards models for survival data with long-term survivors. Statistics & Probability Letters,76, 1685-1693, 2006. Wu, X., Wang, J. and Zhou, X. Commonotonically additive premium principles and some related topics. Actuarial Science: Theory and Methodology, Chapter 3 (pp.93-132), Editor: H.J. Shang, Higher Education Press, China and World Scientific Publishing Co Pte Ltd, Singapore, ISBN 9812565051, 2006. You, J. and Zhou, X. Statistical inference in a panel data semiparametric regression model with serially correlated errors. Journal of Multivariate Analysis, 97, 844-873, 2006. Wu, X., You, J. and Zhou, X. Asymptotic properties of the ISE in nonparametric regressions with serially correlated errors. Communications in Statistics-Theory and Methods, 34, 943-953, 2005. Chen, G., You, J. and Zhou, X. B-Spline estimation in a semiparametric regression model with nonlinear time series errors. American Journal of Applied Sciences, 2, 1343-1349, 2005. Cai, X., Wu, X and Zhou, X. Dynamically optimal policies for stochastic scheduling subject to preemptive-repeat machine breakdowns. IEEE Transactions on Automation Science and Engineering,2, 158-172, 2005. You, J. and Zhou, X. Empirical likelihood in a Regression model with noised variables. Journal of Statistical Planning and Inference 2(9), 1343-1349, 2005. You, J. and Zhou, X. The law of iterated logarithm of estimators for partially linear panel data models. Statistics & Probability Letters, 75,267-279, 2005. You, J. and Zhou, X. Bootstrap of a semiparametric partially linear model with autoregressive errors. Statistica Sinica, 15, 117-133, 2005. Cai, X. and Zhou, X. Single-machine scheduling with exponential processing times and general stochastic cost functions. Journal of Global Optimization, 31, 317-332, 2005. You, J. and Zhou, X. Wavelet estimation in varying-coefficient partially linear regression models. Statistics and Probability Letters, 68, 91-104, 2004. Cai, X., Sun, X. and Zhou, X. Stochastic scheduling subject to machine breakdowns: the preemptive-repeat model with discounted reward and other criteria. Naval Research Logistics, 51, 800-817, 2004. Sun, L., Sun, J. and Zhou, X. A Uniform semiparametric approach for longitudinal data analysis, Far East Journal of Theoretical Statistics, 13, 233-256, 2004. Cai, X. and Zhou, X. Deterministic and stochastic scheduling with team-work jobs. Naval Research Logistics, 51, 818-840, 2004. Shao, Q. and Zhou, X. A new parametric model for survival data with long-term survivors. Statistics in Medicine, 23, 3525-3543, 2004. Cai, X. and Zhou, X. Stochastic scheduling with earliness and tardiness penalties. Handbook of Scheduling: Algorithm, Models, and Performance Analysis, Chapter 39, Editor: J. Y-T. Leung, Chapman & Hall/CRC, New York, ISBN 1584883979, 2004. Cheung, C.K., Shi, W.Z. and Zhou, X. A probability-based uncertainty model for point-in-polygon analysis. GeoInformatica 8:1, 71-98, 2004. Sun, L. and Zhou, X. Additive hazards regression with missing censoring information. Statistica Sinica, 13, 1237-1257, 2003. Cai, X., Sun, X. and Zhou, X. Stochastic scheduling with preemptive-repeat machine breakdowns to minimize the expected weighted flowtime. Probability in the Engineering and Informational Sciences, 17, 467-485, 2003. Maller, R.A. and Zhou, X. Testing for individual heterogeneity in parametric models for event-history data. Mathematical Methods of Statistics, 12, 276-304, 2003. You, J. and Zhou, X. Jackknifing in Partially Linear Regression Models with Serially Correlated Errors. Journal of Multivariate Analysis, 92, 386-404, 2003. Choi, K.C. and Zhou, X. Large-sample properties of mixture models with covariates for competing risks. Journal of Multivariate Analysis, 82, 331-366, 2002. Maller, R.A. and Zhou, X. Analysis of parametric models for competing risks data. Statistica Sinica,12, 725-750, 2002. Maller, R.A.. Sun, L. and Zhou, X. Estimating the expected total number of events in a process. Journal of the American Statistical Association, 97, 577-589, 2002. Sun, L. and Zhou, X. Regression analysis for a semiparametric model with panel data. Statistics and Probability Letters, 58, 309-317, 2002. Chen, G., Sun, J., You, J and Zhou, X. Convergence rates of estimators in partial linear regression models with MA(∞) error process. Communications in Statistics ââ‚¬" Theory and Methods, 31, 2251-2273, 2002. Sun, X., Wang, J. and Zhou, X. Estimation of the multivariate normal precision matrix under the entropy loss. Annals of the Institute of Statistical Mathematics, 53, 760-768, 2001. Sun, L., and Ren, H. and Zhou, X. Survival function and density estimation for truncated dependent data. Statistics and Probability Letters, 52, 47-57, 2001. Sun, L., and Ren, H. and Zhou, X. Quantile estimation for left truncated and right censored data. Statistica Sinica, 10, 1217-1229, 2000. Cai, X. and Zhou, X. Asymmetric earliness-tardiness scheduling with exponential processing times on an unreliable machine. Annals of Operations Research, 98, 313-331, 2000. Cai, X. and Zhou, X. Stochastic scheduling on parallel machines subject to random breakdowns to minimize expected costs for earliness and number of tardy jobs. Operations Research, 47, 422-437, 1999. Maller, R.A., Vu, H.T. and Zhou, X. Asymptotic properties of a class of mixture models for failure data: the interior and boundary cases. Annals of the Institute of Statistical Mathematics, 50, 627-653, 1998. Vu, H.T. and Zhou, X. Generalisation of likelihood ratio tests under nonstandard conditions. Annals of Statistics, 25, 897-916, 1997. Cai, X. and Zhou, X. Sequencing jobs with random processing times to minimize weighted completion time variance (1997). Annals of Operations Research, 70, 241-260, 1997. Ghitany, M. and Zhou, X. Asymptotic results for Exponential failure models with imperfect signalling and covariates. Communication in Statistics ââ‚¬"Theory and Methods, 26, 801-820, 1997. Cai, X. and Zhou, X. Scheduling stochastic jobs with asymmetric earliness and tardiness penalties. Naval Research Logistics, 44, 531-557, 1997. Cai, X. and Zhou, X. General stochastic single-machine scheduling with regular cost functions. Mathematical and Computer Modelling. 26, 95-108, 1997. Cai, X. and Zhou, X. Variance minimization: a relation between completion time variance and waiting time variance. Journal of Australian Mathematical Society, Series B, 38, 126-139, 1996. Maller, R.A. and Zhou, X. Testing for sufficient followup and outliers in survival data. Journal of the American Statistical Association, 89, 1499-1506, 1995. Ghitany, M.E., Maller, R.A. and Zhou, X. Estimating the proportion of immunes in censored samples: a simulation study. Statistics in Medicine, 14, 39-49, 1995. Maller, R.A., Speed, T. and Zhou, X. On a shared allele test of random mating. Australian Journal of Statistics, 37, 61-72, 1995. Maller, R.A. and Zhou, X. Testing for the presence of immune or cured individuals in censored survival data. Biometrics, 51, 1197-1205, 1995. Maller, R.A. and Zhou, X. Likelihood ratio test for the presence of immunes in a censored sample. Statistics, 27, 181-201, 1995. Exponential mixture models with long-term survivors and covariates (with M. E. Ghitany and R. A. Maller). Journal of Multivariate Analysis, 49, 218-241, 1994. Jammalamadaka, S. and Zhou, X. Goodness of fit in multidimensions based on nearest neighbour distances. Journal of Nonparametric Statistics, 2, 271-284, 1993. Maller, R.A. and Zhou, X. The probability that the largest observation is censored. Journal of Applied Probability, 30, 602-615, 1993. Maller, R.A. and Zhou, X. Estimating the proportion of immunes in a censored sample. Biometrika, 79, 731-739, 1992. Jammalamadaka, S. and Zhou, X. Some goodness of fit tests in higher dimensions based on interpoint distances. Proceedings of the R. C. Bose Symposium on Probability, Statistics an Design of Experiments, Delhi, 27-30, (1988), Wiley Eastern, New Delhi, 391-404, 1990. Bruss, T., Jammalamadaka, S. and Zhou, X. On an interval splitting problem. Statistics and Probability Letter, 10, 321-324, 1990. Jammalamadaka, S. and Zhou, X. Bahadur efficiencies of spacings tests for goodness of fit. Annals of the Institute of Statistical Mathematics, 41, 541-533, 1989. Jammalamadaka, S., Tiwari, R. and Zhou, X. Asymptotic efficiencies of spacings tests for goodness of fit. Metrika, 36, 355-377, 1989. Aras, G., Jammalamadaka, S., Tiwari, R. and Zhou, X. Limit distribution of spacings statistics when the sample size is random. Statistics and Probability Letters, 8, 451-456, 1989. Cai, X. and Zhou, X. Stochastic scheduling with earliness and tardiness penalties. Handbook of Scheduling: Algorithm, Models, and Performance Analysis, Chapter 39, Editor: J. Y-T. Leung, Chapman & Hall/CRC, New York, 2005. Maller, R.A. and Zhou, X. Survival Analysis with Long-Term Survivors, Wiley, Chichester, New York, London, 1996. Last Updated: 2018-04-27 10:22:37 by Mr William Dang.